Recently, the Ministry of Land, Infrastructure and Transport disclosed the rank of domestic commercial business real estate with the highest real transaction prices. The data was based on the real transaction prices of the commercial business real estate dealings that were reported since the introduction of the Real Estate Transaction Declaration system in January 2006. From this data, the owners of the buildings with the highest price were examined. It was rarely the case that a single individual owned buildings that cost several hundred billion won, most were owned by corporates, or in other words, under a corporate name. But as these companies are also owned by a person, it can be deemed that the owners of the corporates are the owners of the real estate. The data also showed that the top 11 highest priced buildings were all located in Seoul, with the average price in the capital over 25 times that of the national average. The 11 buildings are important landmarks and they are expected to become new company head offices upon renovation or undergo reconstruction, attracting interest from foreign investors. 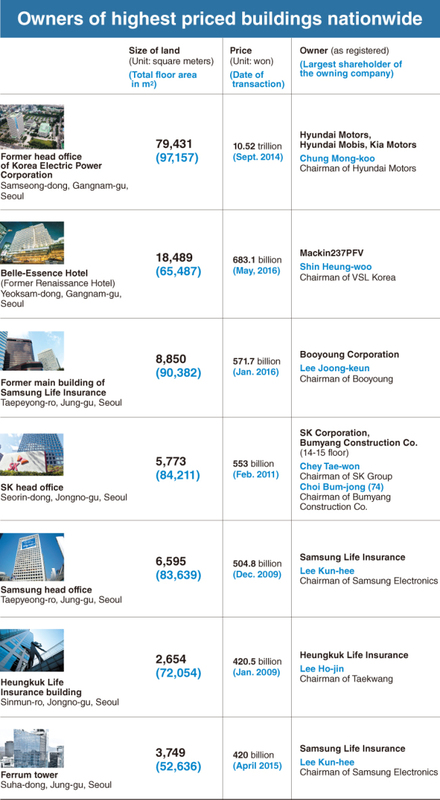 Among these buildings, seven are owned by billionaires on Korea’s richest 100 list. The building with the highest real transaction price was the former head office of Korea Electric Power Corporation in the Gangnam district which was sold in September 2014 for 10.52 trillion won ($8.8 billion). The total floor area of the building is 176,588 square meters. It was stated in the register that this real estate is shared among Hyundai Motor (55 percent), Hyundai Mobis (25 percent), and Kia Motors (20 percent). Chairman Chung Mong-koo, the largest shareholder of Hyundai Motor and Hyundai Mobis, also controls Kia motors indirectly through his status as the largest shareholder of Hyundai Motor. Chung has shown great interest in this area where he is planning to build what he called the “Global Business Center.” In July, he visited the site and emphasized that GBC is the symbol of the new century that the Hyundai Group is facing and is the key to becoming a national-class corporate. Chairman Chung promised the Seoul City government that the Hyundai Group would pay 1.75 trillion won as a public contribution while developing this area. 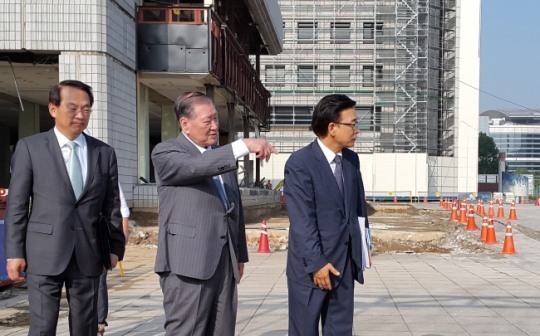 Hyundai Motor Chairman Chung Mong-koo (center) surveys a site for the "Global Business Center" in Samseong-dong, Seoul, in July. Chairman of Samsung Electronics Lee Kun-hee, who owns over 15 trillion won in personal assets, is also a part of this line up. He is the largest shareholder of Samsung Life Insurance (20.76 percent) and owns the Samsung main building in Taepeyong-ro and the Ferrum tower in Suha-dong, Jung-gu, through this status. The total price of the two buildings as stated on the transaction record is 924.8 billion won. Samsung’s former headquarters was purchased by Booyoung last January for 571.7 billion won. According to the real estate register, the owner is Booyoung Housing which fully belongs to the Booyoung Corporation, while 93.8 percent of the latter‘s share is owned by Chairman Lee Joong-keun. Former Chairman of Taekwang Group, Lee Ho-jin, with a total asset value of 1.2 trillion won (as of Dec. 16, 2016), also owns one of the highest priced buildings -- the Heungkuk Life Insurance building. Well-known for the sculpture “Hammering m,” it has a total floor area of 74,708 square meters. In 2009, Taekwang handed its ownership over to Heungkuk Life Insurance, receiving 420.5 billion won in return. Former Chairman Lee Ho-jin is the largest shareholder with 15.81 percent of the shares of Taekwang Group. He also owns a 56.3 percent share of Heungkuk Life Insurance making him its largest shareholder. That is to say, the transaction was made between two corporations that used to share the same owner. There are also some owners of the highest priced buildings that are not listed on the Superich Team’s Korea’s Richest 100 list. VSL Korea bought the Belle-Essence Seoul Hotel (former Renaissance Hotel) in the Gangnam district last May. The real transaction price was 683.1 billion won. Led by Chairman Shin Heung-woo, VSL Korea is a medium-sized construction company. Shin purchased the building from Sambu Construction Co. for 1 trillion 300 billion won and is planning to reconstruct it as a new multi-complex building.